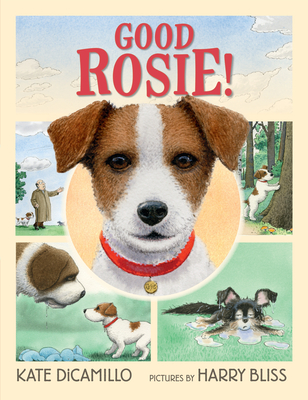 The delightful comic-style GOOD ROSIE!, written by Kate DiCamillo and illustrated by Harry Bliss…Together they’ve created a remarkable guide to making friends: be honest and direct about what you want, and don’t bite. ‘Good Rosie!’ is divided into eight sections, like mini-chapters, slowing down the pace and making it not just good read-aloud but a fantastic choice for newly independent readers. Cartoonist Bliss' humor shines as it works with DiCamillo's understated text. Subtle lessons about entering a new and unfamiliar territory, finding companions, and the value of a friendly, approachable attitude are all conveyed with a delicate touch. Good Rosie—good story. DiCamillo’s deep empathy for her shy, lonely protagonist will come as no surprise, but her portrayal of Rosie as genuinely puzzled by the mechanics of friendship is particularly astute. Bliss (Diary of a Worm) works in a paneled comics format, and it proves felicitous for his formal drawing style and deadpan humor. This is no shaggy dog story—it’s thoughtful and funny, and a real gift for emerging readers. DiCamillo’s contemplative, understated text perfectly complements Bliss’s elegantly composed watercolors. Forging new bonds can be both tantalizing and overwhelming, they acknowledge, but children will feel up to the challenge after seeing Rosie conquer her anxieties. A superb friendship story and a lovely choice for one-on-one sharing, especially with little ones with first-day-of-school jitters. Short, episodic chapters and a gentle plotline make this winsome graphic novel particularly well suited to early readers...With humor and heart, this easy, inviting volume offers an empowering message to little ones nervous about making new friends. Comic-book panels, with a mixture of easy narrative text and balloon dialogue, make the book a good choice for new readers, and Bliss’s crisp line-and-watercolor illustrations are lovingly attentive to real dog postures and poses...DiCamillo—casually, expertly—drops musings about the quirks and turns of friendship into the deceptively straightforward story. This full-color story will be a winner with young readers, the small details in the illustrations allowing each reader to discover ways to make this simple story come alive. The paneled format and the short sections make this inviting for nervous readers, and Bliss’ line and watercolor illustrations bring a touch of comedy to the dog-park scenes without overwhelming the mood. Readers will appreciate the chance to pace themselves over the longer format, and they’ll be pleased with Rosie’s finally finding her crew. It's all about skills, the kind kids practice in the first days of school and beyond — being gentle, giving second chances, and asking others to play. The comic frames work perfectly, advancing the story and allowing for imagination. Both author and illustrator "wanted kind fo Charles Schulz feel to things" with a heartbroken and hopeful quality to resonate with savvy, emergent readers. They got it. Good job!